2018 brings new opportunities and amazing places to stay in when on your next trip to Israel. 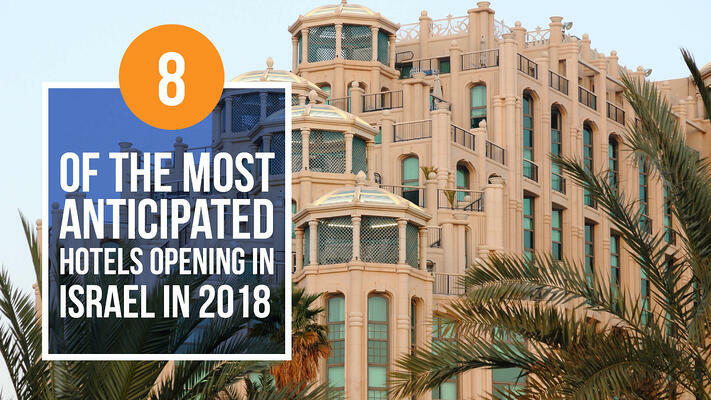 With a growing number of tourists each year, new hotels will be opened in order to provide the best service and ensure an amazing experience to all tourists. Along with the already popular and luxurious hotels, eight new ones will open their doors to tourists and ensure an unforgettable stay. Here is the list of the eight new hotels that you should check if you have a chance to visit Israel. Located on Tel Aviv’s Rothschild Boulevard, this new hotel will make its guests feel like the locals. Local mixologists prepare some of the best cocktails, not just in the hotel’s bar but also for its lobby vending machine. Unplastered walls, raw floors, indoor and outdoor greenery in combination with the original 1950s office building and the industrial style make this hotel stand out among nearby boutique hotels. Local designers Tomer Nachshon and Ohad Benit made sure to furnish the hotel’s 39 rooms and make it look luxurious with its custom furniture and light fixtures. Six Senses Shaharut is located in a desert landscape in the Negev’s Arava Valley, surrounded by Negev highlands and Edom Mountains. The hotel, whose opening is expected in late 2018, will offer 58 villas and suites, with private pools that perfectly blend with the surrounding. Local rocks were used In the building process, and the interior will be enriched with the products of local artisans. With its own garden and help of local farmers, the hotel will provide fresh ingredients for its grill and bar. Its guest will have an opportunity to practice yoga, fitness, and enjoy spa treatments. An open-air amphitheater and camel rides will be available for the hotel’s guests. This unique hotel with rich history is located in the heart of Jaffa. It took 20 years of work to preserve its original Ottoman-era features. Some of the artifacts from the Crusader area were found at the site during the digs. The hotel is an old fortress built in 1886. Throughout the history, it also served as a police station and a prison. The hotel features five buildings with 120 grand and deluxe rooms and a courtyard. The hotel’s guests will be able to enjoy a Turkish hamam and a rooftop pool with an astonishing view. In the spring of 2018, tourists in Israel will have a chance to check out the new hotel, The Jaffa. It was designed by a famous world designer John Pawson and a local architect Ramy Gill. In the 19th century, the hotel building used to be a French hospital. Its original features have been preserved, and to ensure more space for its guests, an additional building was added. The hotel’s guests will be able to enjoy a spa, 127 rooms, outside deck with a pool and a private beach. The hotel will feature a six-story wing with 32 private residences. For young and urban tourists, Brown Hotels group is planning to open a new hotel in the summer months of 2018, a Dave South hotel. Another one, Dave West, was opened earlier this year, and this is just one of the hotels in a “Sons of a Brown” hotel chain in Tel Aviv and Jerusalem. The hotel is planning to resemble the city’s eccentric soul, provide luxurious accommodation, and all that for affordable prices so the young visitors can have enough money left for all other things they desire. In late 2018, a new hotel will be opened on the Migdal Shore of the Galilee. Sea of Galilee hotel will feature 200 rooms. All of the rooms will have a balcony which will face Mount Arbel and the Sea of Galilee. The area has become very popular among Christian tourists due to its town Migdal, known to be Mary Magdalene’s native town. A new hotel in the south of Tel Aviv will feature 42 rooms, overlooking Jaffa, waterfront or the courtyard of the hotel. The Drisco hotel opening is scheduled for April this year. This hotel’s property was once a luxurious hotel, the Jerusalem Hotel, opened by American colonists. After its closing in 1940, the building served as a British military headquarters and a Jewish refugees site. The Rimonim hotel chain plans to open a new hotel in late 2018, the Kedma hotel. The building is located in Sde Boker, which is Negev desert’s kibbutz. This boutique hotel will feature 140 suits and rooms with the interior reflecting the ancient Spice Route and the spirit of the desert. The hotel’s guests will be able to enjoy activities such as hiking, bike rides, camel rides and many more.